There are so many great recipes I want to share with you right now, but this got pushed straight to the front of the line. Sorry if I sound like a broken record talking about my garden this year, but I’m just so thankful for the weather we’ve been having. After the worst winter ever (which we are still totally scarred by), this summer has been perfect. It hasn’t been hot enough to turn the yard into desert like a few years ago, and we’ve had rain every few days so we almost never need to water the garden ourselves. Everything is flourishing and each day my arms are full with the produce we pick. Without a doubt, my favorite of them all is the fresh tomatoes, particularly the heirlooms. I’ve been anxiously observing them each day, taking their time to fully ripen. This week the first few were finally ready to be picked and I knew I wanted to make a meal centered around them. You may recall this tart from the early days of this blog. 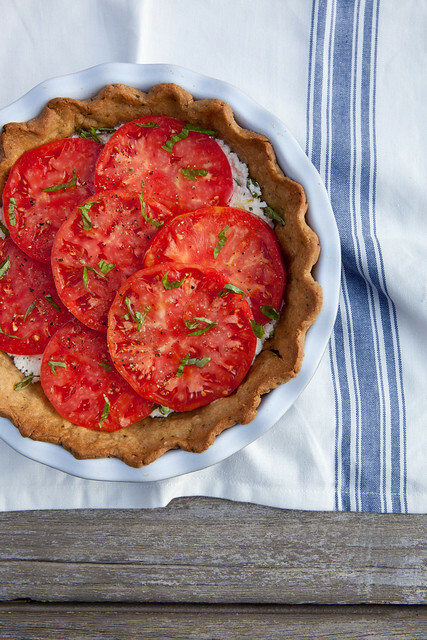 That was part of my inspiration for this, but because summer tomatoes are at their best simply sliced and lightly seasoned, I wanted to keep them raw for this pie. The herbed ricotta from the roasted zucchini sandwiches came to mind and I knew it would be a perfect pairing. 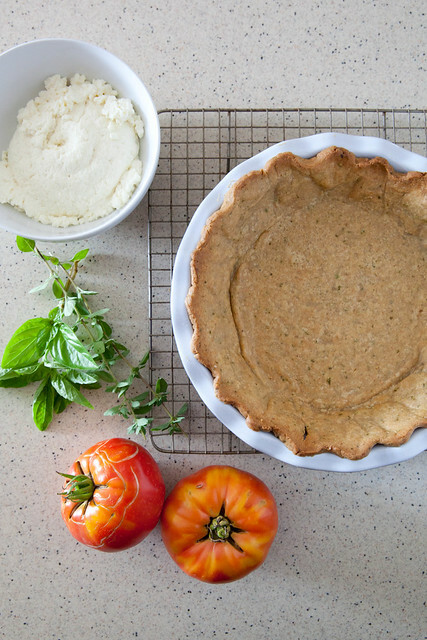 So this was the result – a whole wheat garlic herb pie crust, blind baked and then filled with fresh herbed ricotta. Thick slices of fresh tomato are layered on top, dressed only with a light drizzle of olive oil along with salt and pepper. I was worried it might not slice neatly but thanks to the fresh ricotta, the slices were actually gorgeous. Sorry no photo of those – we were too busy digging in. This is a perfect seasonal entree and a great way to highlight summer tomatoes in all their glory. I hope you love it as much as we do! To make the crust, combine the garlic and basil in the bowl of a food processor. Pulse until finely minced, scraping down the bowl as needed. Add in the flour and salt and pepper to taste, and pulse again to combine. (If you don’t have a food processor, just mince the garlic and basil as well as you can and then stir into the flour mixture. It will work just fine.) Add in the butter and pulse until the mixture resembles coarse meal and the largest butter pieces are the size of peas. Add in the water and pulse just until the dough comes together. Remove from the bowl, form into a disc and cover with plastic wrap. Transfer to the refrigerator and chill 1-2 hours, until firm. *Note: Please do not use store bought ricotta when it is so incredibly easy to make your own. 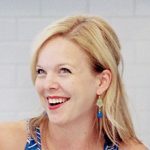 (Unless you live near a store like Eataly – then by all means, go for it.) Fresh ricotta is far superior in flavor and texture to the store bought variety and once you try it, you will wonder how they can even share the same name.